The European Union to support local production of fortified food in Chad, where malnutrition is a major obstacle to development. 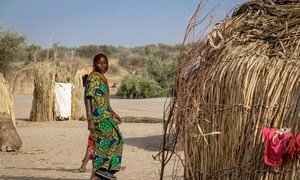 “Thanks to the EU’s contribution of €5 million, the participating UN agencies are on the path to reaching Sustainable Development Goal 2 – to achieve zero hunger by 2030,” said Mary-Ellen McGroarty, World Food Programme (WFP) Country Director for Chad. The joint project, “Local production of complementary fortified food” (PRO-FORT), aims at promoting local production of quality food; reinforcing production capacities and marketing of fortified food; encouraging the uptake of better maternal and child nutrition practices; and reducing malnutrition. Chronic malnutrition has serious and sometimes irreversible consequences on children’s cognitive and physical growth, which continues into adulthood and considerably reduces their productivity, with a negative impact on productivity during adulthood. Further, over half of the adult population suffered from stunting during their childhood, according to the Cost of Hunger Study in Chad (October 2016). Therefore, UNICEF and its partners will support behavioural change communication campaigns and will promote the uptake of locally produced nutritious food, as part of the healthy nutritional practices promotion. As fighting against malnutrition being one of its key priorities, the Food and Agriculture Organization (FAO) will together support Chad’s National Nutrition and Food Policy and the National Investment Programme in the Rural Sector. “Through the local production of complementary fortified food, which adheres to quality international standards, we are delighted to improve access, availability and use of highly nutritious food for the most vulnerable, especially for young children,” said Mohamadou Mansour N’Diaye, the FAO Representative in Chad. This new partnership is a complement to the 11th European Development Fund, through which the EU will invest more than 156 million from 2016 until 2021 to improve efforts to combat chronic malnutrition. It will be piloted in Mayo-Kebbi East, Mayo-Kebbi West and Kanem regions. These Chadian regions are affected by chronic hunger, with levels of malnutrition either close to or surpassing World Health Organization’s (WHO) emergency threshold of 30 percent, though favourable conditions for good agricultural production exist.